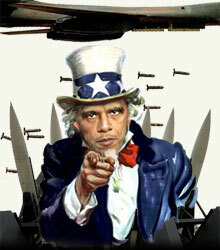 As Barack Obama prepares to accept the Nobel Prize for Peace, he is also preparing to escalate war. He and the system he so loyally represents have little else to offer Americans or the rest of the world. Just in case there is anyone who didn’t get the memo, the announcement came straight from West Point. Obama is outdoing his predecessor George W. Bush by using soldiers and military installations as photo opportunity backdrops. The message is clear. There is no commitment to do anything else but keep the war machine humming. While most Americans focus on the latest marketing extravaganza executed by team Obama, nations in the rest of the world do as much as they can to fight imperialism. The useless corporate media inspire handwringing over Iran’s decision to build more nuclear enrichment facilities, but the more important news about Iran is ignored. Iranian President Mahmoud Ahmadinejad made official visits  to Brazil, Bolivia and Venezuela to strengthen trade agreements with those nations, and to talk about ending thesupremacy of the dollar . Barack Obama didn’t like it very much, but no one in these countries seemed to care about the Nobel laureate’s two cents worth of opinion. He sent a letter to Brazilian president Lula, admonishing him for welcoming Ahmadinejad. In case Obama didn’t get this memo, Ahmadinejad is not a pariah everywhere on earth, no matter how much American press and politicians fume and fuss. No one cared about what the president wanted and Ahmadinejad’s itinerary remained unchanged. These nations that are seldom noticed are playing a larger role in world affairs than the average America could possibly imagine. Venezuela, Brazil and Bolivia are not sticking their fingers in America’s eye merely out of spite. They want to be free of “dollar hegemony” and they are backing up their words with action. They have in fact begun using their own currency in an effort to escape American control of their destinies. While Americans giddily applaud the latest Team Obama marketing extravaganza, the world takes its cues less and less from Uncle Sam. We in the U.S. are left in a state of disinformation so complete that we rarely know what the rest of the world is doing. Americans fail to understand that when most other nations think about our country, it is about ways to escape from its clutches. Military prowess seems to be the only power the United States has left. It apparently has no ability to help its own people. One in four homeowners are “underwater” on their mortgages, owing more to the bank than their homes are worth. The Obama administration has done nothing about this human and economic catastrophe. One in eight Americans receive food stamps, a staggering 49 million people in need of some assistance to keep food on the table. The record number of bank failures, the precarious state of the Federal Deposit Insurance Corporation and the lack of health care for millions are likewise left unaddressed. War is always on the table and is never rejected. Obama is George W. Bush with a higher IQ and a better vocabulary. He knows just what words to use in order to get away with murder. The war effort will not be open ended: we are fighting terrorism, we will help the Afghan people and so on. Just a few thousand more civilian deaths and then Johnny can come marching home again. It is easier to like the imperialist who speaks well. Obama has snob appeal and that is enough reason for millions of people who should know better to give him a pass, even as he asserts the right to keep killing human beings. If Barack Obama is not greeted by protesters in Oslo then the world is indeed in a very bad place. It is now official. War is peace if you market it well enough. The marketing creation that is Obama can get away with murder or just about anything else. The peace prize committee should stick to honoring dissidents living under house arrest. It is difficult to fathom how the man in charge of a military budget larger than that of the rest of the world combined can get a prize for peace making. Perhaps the committee can take the prize back. It would be a controversial and difficult thing to do, but no worse than sullying their formerly good names with a bizarre and shameful decision they will surely regret. Margaret Kimberley‘s Freedom Rider column appears weekly in BAR. Ms. Kimberley lives in New York City, and can be reached via e-Mail at [email protected].